News of the day : Nvidia is working hard to get new architecture every two years Tesla - Fermi - Kepler - Maxwell reported by guru3d. 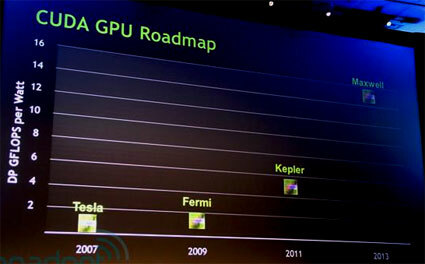 According to Jen-Hsun Huang hundreds of engineers are already hard at work on new GPU architecture under codename "Kepler", expected to go to production this year and ship in 2011 , and later on 2013 Nvidia will prepare the Maxwell GPU architecture witch will be 8 to 9 times faster per watt then the current Fermi GPU architecture . Kepler's will be based on a 28nm fabrication process, and deliver an estimated 3 to 4 times the performance per watt compared to Fermi, which first products rolled out of the fabs only earlier this year. The roadmap also showed "Maxwell" due in 2013 supposedly bringing a sixteen-fold increase in parallel graphics-based computing just two years after that, including advanced features like the ability to autonomously process some content independent of a CPU.